At 8:00 am, the skies were nice and blue. By 11:12 am, thanks to about 10-12 passing planes,the skies are now unnaturally hazy. The attached photo shows plane activity around 9:30 am. 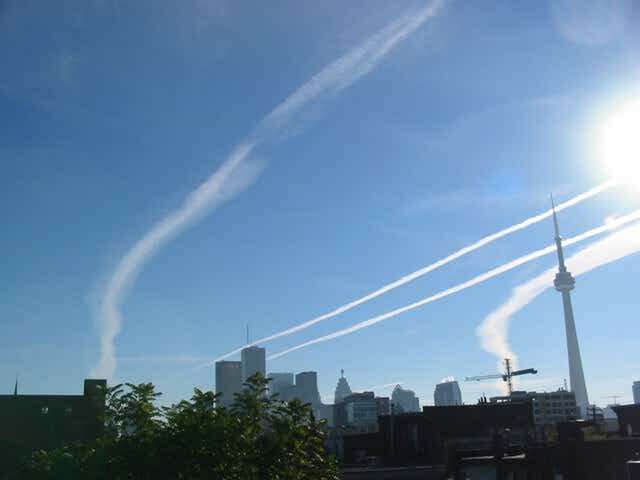 Strange that none of these planes needed to land at Toronto International Airport, one of the biggest international airports in the world. And, even if the trails are exhaust, or caused by pollutants in the air, shouldn't there be concern over the health effects for the people living below?